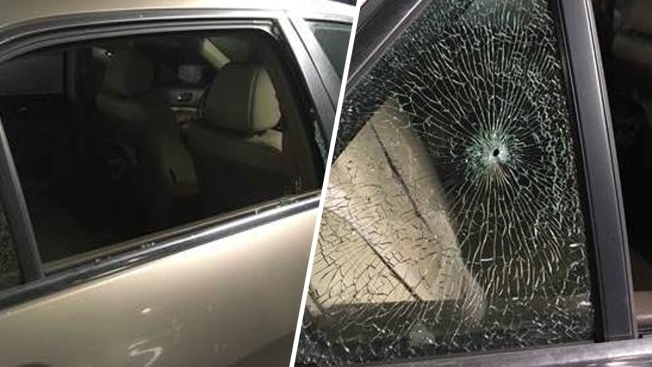 A driver said she is OK after reporting that one her car windows was shot out by an apparent pellet gun while she was driving in the South Bay Tuesday morning, according to the California Highway Patrol. A woman named Candace, who did not want to give her last name, told the CHP she was driving along southbound Interstate 680 near Berryessa Road around 6:10 a.m. when her car was struck by pellets, according to the law enforcement agency. Candace, who reported the shooting from her home, said she was not hit by the pellets, but one of her rear windows was damaged. Officers who came to check out her car also noticed that a pellet left a dent inside her vehicle, according to the CHP. The CHP suspects that the shots came from another moving vehicle. There are no leads in the case, and a suspect vehicle description was not available, according to the CHP. Tuesday's shooting marks the first such occurrence in the San Jose area this year involving a vehicle that was hit by pellets, according to the CHP. The CHP did note that these reports are not uncommon. Roughly one week ago, windows of charter buses transporting Google and Apple employees were damaged as the vehicles were cruising along Interstate 280, according to the CHP. The CHP was not exactly sure what caused the damage, but an officer said a pellet gun could have been the culprit.